Precision, taste and consistency: that’s what you’ll find coming out of the robotic kitchen at Spyce, now open for business on 241 Washington Street in Boston’s Downtown Crossing neighborhood. 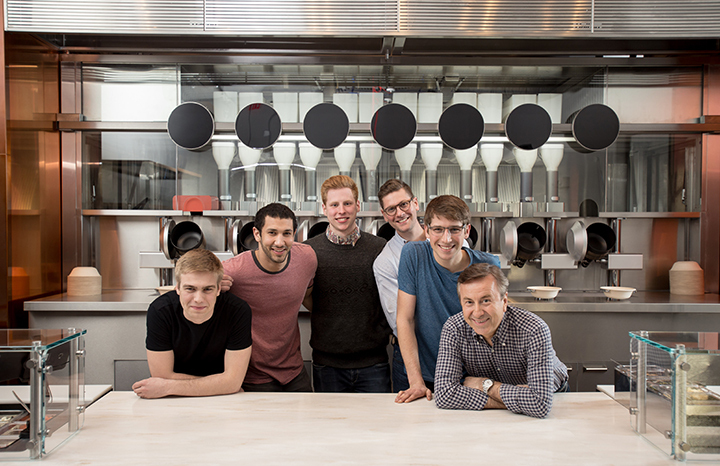 This fast-casual concept and glimpse of the future is the brainchild of Kale Rogers, Michael Farid, Brady Knight and Luke Schlueter; the former MIT students grew hungry for nutritional yet affordable meals that would suit their water polo diets and beyond. Calling themselves “robotics-obsessed,” the engineers developed a self-sustaining kitchen prototype in the basement of their fraternity house. Knowing this could be an industry game-changer, Farid, the company’s CEO, tapped into an industry vet—by guessing the correct email address on the first try—Daniel Boulud. Pictured from left: Luke Schlueter, Michael Farid, Kale Rogers, Sam Benson, Brady Knight and Daniel Boulud. Boulud became enamored with the email pitch and ultra-modern robot kitchen. He signed on as both an investor and culinary director, and summoned Café Boulud alum Sam Benson to lead the team as executive chef. Benson brings both old-world French techniques and corporate cooking experience at Chipotle to Spyce, highlighting “appropriately sourced” ingredients. Upon entering Spyce, a “guide” will help you peruse the bowl-based menu; everything is customizable, including the ability to suit vegan and gluten-free diners, and has a starting price point of $7.50. Bowls include the “Beet” featuring beets, carrots, sautéed kale, freekeh, tomato-cucumber salad, sunflower seeds and goat cheese, and “Thai” with roasted chicken, sweet potatoes and bok choy in a Massaman curry sauce with brown rice. 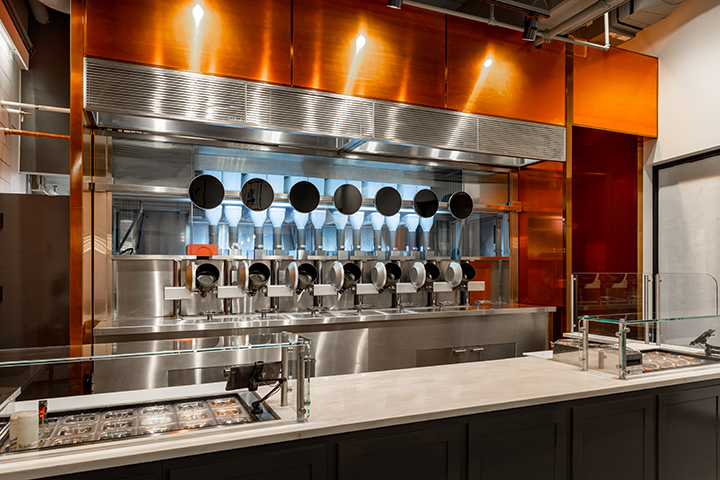 Once an item is selected, that's when the fun begins: the seven wok robotic station uses volumetric dispensers to portion out the correct number of ingredients for each bowl. The woks heat via induction, and constantly tumble the food for an even sear and proper temperature before pouring it into a bowl. 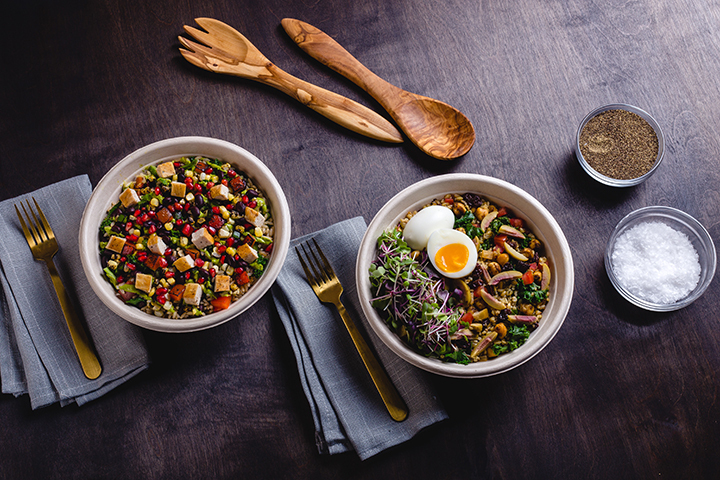 To ensure consistency, as well as beautiful plating, bowls are finished via the employee-driven garde manger station; everything from start to finish takes three minutes or less. “I really hope that our customers will leave feeling that they’ve gotten a delicious, exciting and amazing meal at a really affordable price,” says Farid, per the restaurant’s website. Is there room for expansion? Absolutely, but only time will tell. “We’d love to expand, but right now, we're focused on getting this first one right and building a community around Spyce," adds Farid. Spyce is located at 241 Washington Street in Boston and open from 10:30 a.m. to 10:00 p.m. everyday. All images courtesy of Spyce.